The Search for Extraterrestrial Intelligence (SETI) has a low probability of success, but it would have a high impact if successful. Physicists Paul Davies and Robert Wagner of Arizona State University argued last year that it makes sense to widen the search to scour the Moon for possible alien artifacts. At Penn State, researchers propose the same type of searchsearch for Mars. To date, SETI has been dominated by the paradigm of seeking deliberately beamed radio messages. The ASU team argued that Alien civilizations may have sent probes to our region of the galaxy, and that any mission to the solar system would probably have occurred a very long time ago. The lunar environment could preserve artifacts for millions of years due to the absence of erosion and plate tectonics. Indirect evidence for extraterrestrial intelligence could come from any incontrovertible signatures of non-human Alien technology. Existing searchable databases from astronomy, biology, earth and planetary sciences all offer low-cost opportunities to seek a footprint of extraterrestrial technology. Davies and Wagner reason that the rapidly-expanding database of the photographic mapping of the Moon's surface by the Lunar Reconnaissance Orbiter (LRO) to 0.5 m resolution offers an ideal opportunity to search for ancient artifacts and has mapped a quarter of the moon's surface since mid-2009. Among the LRO images, scientists have spotted the Apollo landing sites as well as all of the Nasa and Soviet unmanned probes, some of which were revealed only by their odd-looking shadows. Nasa has made more than 340,000 LRO images public, but that figure is expected to reach one million by the time the orbiting probe has mapped the whole lunar surface. "From these numbers, it is obvious that a manual search by a small team is hopeless," the scientists write. The seismometer on Nasa's Apollo 12 mission detected only one impact per month from roughly grapefruit-sized meteorites within a 350km radius. According to Davies and Wagner, it could take hundreds of millions of years for an object tens of metres across to be buried by lunar soil and dust kicked up by these impacts. Software can search for strange-looking features, such as the sharp lines of solar panels, or the dust-covered contours of quarries or domed buildings. These might be visible millions of years after they were built. Systematic scrutiny of the LRO photographic images is being routinely conducted for planetary science purposes, and this program could be expanded and outsourced at little extra cost to accommodate SETI goals, after the fashion of the SETI@home and Galaxy Zoo crowd-sourcing projects. Hundreds of thousands of pictures of the moon will be examined for telltale signs that aliens once visited our cosmic neighbourhood if plans go ahead. Online volunteers could be set task of spotting alien technology, evidence of mining and rubbish heaps in moon images. Elswhere, two researchers at Penn State, are asking "why have we never found evidence of other civilizations in Solar System?" The team is approached the problem mathematically, which shows that we have not looked in enough places to ensure that no extraterrestrial artifacts exist in our solar system. "The vastness of space, combined with our limited searches to date, implies that any remote unpiloted exploratory probes of extraterrestrial origin would likely remain unnoticed," report Jacob Haqq-Misra, Rock Ethics Institute, and Ravi Kumar Kopparapu, Earth and Environmental Systems Institute. Even without actual contact, like us, other civilizations could be sending unpiloted probes to quietly peek at our civilization. These probes, like ours, would be small and might be hidden in a variety of places. In the asteroid belt they would probably go unnoticed, especially if these nonterrestrial objects are only 3 to 33 feet in size, weighing little more than a ton similar to our Voyager craft. "Extraterrestrial artifacts may exist in the solar system without our knowledge simply because we have not yet searched sufficiently," said Haqq-Misra and Kopparapu. "Few if any of the attempts would be capable of detecting a 1 to 10 meter (3 to 33 foot) probe." Haqq-Misra and Kopparapu use a probabilistic method to determine if we have looked closely enough anywhere in the solar system to definitively say there are no nonterrestrial objects here. The analysis is based on answering the question, how sure can we be that we should have already found any nonterrestrial objects lurking in the solar system. They view the solar system as a fixed volume and figure out the percentages of that volume that would need to be thoroughly searched using a discovery capability small enough to detect these probes, assuming that the probes are not consciously camouflaged. The researchers note that most searches to date have not been fine enough to locate such small probes or to totally rule out anywhere. After taking into account a variety of potential biases, such as "the universe is teeming with life" or "life is rare," the team developed an equation that can be applied to a portion of the volume of the solar system and determine whether sufficient searching has been done to ensure that we can say there are no nonterrestrial objects within that volume. "The surface of the Earth is one of the few places in the solar system that has been almost completely examined at a spatial resolution of less than 3 feet," said Haqq-Misra and Kopparapu. But even as humans have spread across the solid surfaces of the Earth, there are still caves, jungles and deserts as well as the ocean floor and subsurface areas that have not been explored. Even with this, the Earth does have a high confidence that no nonterrestrial artifacts exist. The moon and Mars have been searched to a small extent. An ongoing mapping project, the Lunar Reconnaissance Orbiter, is looking at the moon at a resolution of about 20 inches, so we may eventually be able to determine if there are no nonterrestrial objects on the moon. The researchers caution that surface maps may not be sufficient to distinguish between a space probe and a rock. The surface of Mars is still mostly unsurveyed and the researchers' confidence in the probability of no nonterrestrial artifacts is low. Similarly, locations like the Earth-moon Lagrange points, the asteroid belt and the Kuiper belt might also shelter extra solar system probes, but the vast majority of the solar system's volume is uninvestigated. "Searches to date of the solar system are sufficiently incomplete that we cannot rule out the possibility that nonterrestrial artifacts are present and may even be observing us," said Haqq-Misra and Kopparapu. They add that "the completeness of our search for nonterrestrial objects will inevitably increase as we continue to explore the moon, Mars and other nearby regions of space." The infrared images of Mars at the top of the page show both reflected sunlight and heat radiation. 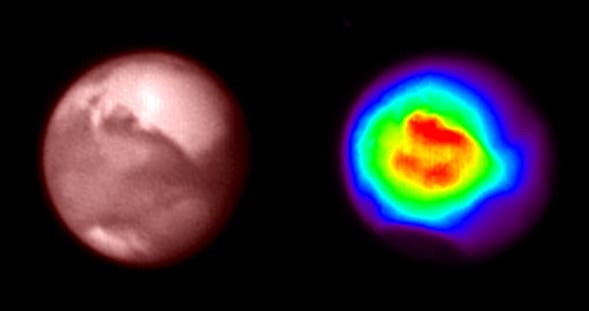 The left one is taken in the near-IR and Mars looks a lot like the eye would see it, with the south pole clearly visible as well as continents. The thermal (heat) image to the right is taken in the so-called M band and clearly shows cold and warm regions on Mars. View Today's Hot Tech News Video from IDG -Publishers of PC World, MacWorld, and Computerworld–Below, at bottom of page.